Which balance is right for me for preparing titration samples?? Every measurement on ANY balance is subject to uncertainty. Understanding this uncertainty is the key to ensuring accurate weighing results and avoiding errors in downstream processing. It is not the readability that determines the accuracy of a weighing instrument, but rather its repeatability. Its minimum net sample weight capability is also of importance. To find the appropriate balance for your needs you need to know the smallest amount you want to weigh and how accurately you need to weigh it (i.e. at what tolerance). How can I improve the accuracy of the liquid sample titration results? To ensure accurate titration samples, the correct balance must be used. (See question 1.) However, to achieve the highest level of accuracy in sample preparation, we recommend using weight for liquid samples as well as solid. Using density to convert the weight value to volume is more accurate than reading the volume from the scale on volumetric glassware. I am weighing fine powders and have problems with static electricity. What can I do? Avoid using plastic and glass containers as they charge quickly. Metal is a better alternative. Remove the risk of electrostatic charges influencing your weighing results by passing the sample and container through an ionizer. METTLER TOLEDO offer a range of different AntiStatic Kits. METTLER TOLEDO Excellence analytical balances incorporate the unique StaticDetect™ technology which provides you with a warning if detected electrostatic charges exceed your pre-defined limits. How can I use my balance to measure volume? I follow ASTM D664 to determine Total Acid Number of my petrochemical products. I have many different sample types with the expected TAN values ranging from 1.0 to higher than 100. Which balance should I use to cover all of my samples? According to ASTM D664, for the lowest TAN values (0.05 - < 1.0), the sample size should be 20 g +/- 2.0 g and requires a weighing accuracy of 0.10 g. For the highest TAN values (100 - < 260), the sample size should be 0.1 g +/- 0.01 g with a weighing accuracy of 0.0005 g.
To accommodate these needs, METTLER TOLEDO would recommend an XPE204 or XPE205 analytical balance. To be sure you select the right balance for your needs, METTLER TOLEDO's global weighing standard, GWP® helps you choose the right balance to meet your application and quality requirements. This service is free. I am analysing degradation of lubricants by determination of Total Base Number (TBN) and I would like to follow the test procedure from ASTM D4739. What is the suitable mass of sample that should be used? How can I make weighing samples for titration more efficient? 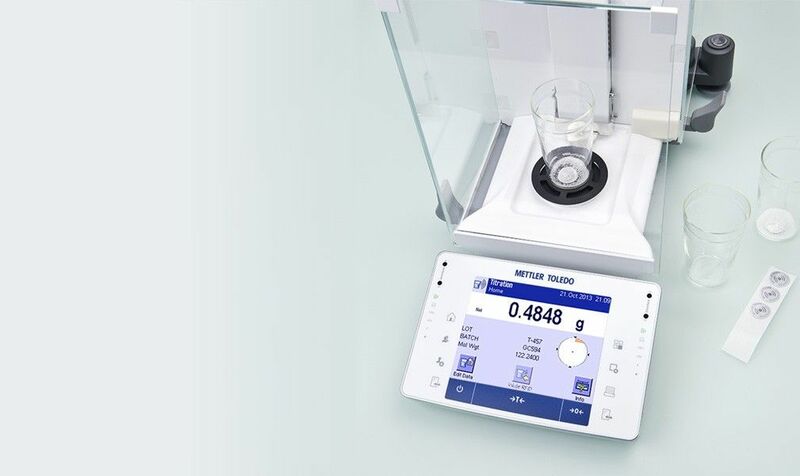 METTLER TOLEDO Excellence balances have a built-in application for titration which helps to simply and speed-up the weighing process. The application works in conjunction with an RFID reader (optional) to read and write data on an RFID tag. The tag is placed on the base of your titration beaker and automatically transfers the sample data securely to selected METTLER TOLEDO titrators. By connecting your balance to METTLER TOLEDO's LabX laboratory software, you benefit further from full step-by-step SOP user guidance and customized processes with all data saved securely in a centralized database. How can I simplify data handling? Sample IDs can be scanned with a barcode reader. METTLER TOLEDO Excellence analytical balances can export weight data quickly and without error to external software using a standardized output protocol so there is no need to record the information by hand. This is particularly useful when weighing numerous samples. For the highest level of data security and ease of data management, LabX laboratory software is recommended. LabX can be used to record all results, balance information, and user details, as well as control the weighing process for all balances in a laboratory. LabX supports you with 21 CFR part 11 compliance. Titration is a widely used analytical technique. It can be used for the analysis and quality control of products across industries such as Pharmaceuticals, Chemicals, Petrochemicals, Food and Beverages etc. Several parameters can be determined, for example: Acidity, alkalinity, metal ions, and active pharmaceutical ingredients. For determination of water content, a special type of titration, known as Karl Fischer Titration, is used. Titration is the determination of the quantity of a specific substance (analyte) contained in a sample by the controlled addition of a reagent (titrant) of known concentration based on the complete chemical reaction between the substance and the reagent. The titrant is added until the reaction is complete (equivalence point). The classical way of monitoring a titration reaction is by adding a suitable indicator to the analyte which changes color when the chemical reaction is complete (titration end-point). Today, the chemical reaction and the end-point can be monitored by means of a sensor. From the consumption and concentration of the titrant as well as the weight of the sample used in the analysis, the content of the analyte can be calculated. Accurately weighing the substances used to prepare both the titrant solution and the analyte sample solution is highly important. Only with accurate sample preparation you can be sure of accurate titration results. The classical way to perform a titration is with a graduated glass cylinder (burette) from which the titrant is manually dispensed, by means of a tap, into the beaker containing the analyte. When the technique was first developed, only those titrations which showed a significant color change upon reaching the endpoint were performed. Today, an indicator dye is added to the analyte. The precision achieved depends mainly on the chemist’s skills and, in particular, on the ability to perceive different colors. Titration has developed rapidly: manual and, more recently, motor-driven piston burettes allow accurate and repeatable titrant addition. Electrochemical sensors have replaced the color indicators thus achieving higher precision and accuracy of results. With the use of microprocessors, the titration can be controlled and evaluated automatically. The whole process of titration can be made much easier through automation using a dedicated instrument known as a titrator. The following method describes the process for preparing titration samples and performing the titration with a titrator. Typical titrations require the titrant and analyte to be in a liquid form (solution). The solid samples are usually dissolved in water, but other solvents, such as glacial acetic acid or ethanol, may be used for specialized applications e.g. in petrochemistry. In preparing for titration, the concentration of the titrant and the weight of the solid analyte must be accurately determined. It is important that all information and measurements are carefully logged, particularly when titrating multiple samples, to avoid any mix-ups between samples and incorrect calculations. The table below provides information on the best techniques for preparing titration samples according to the characteristics of your sample. Preparing titration samples is a key part of many standard titration test methods such as those from United States Pharmacopoeia (USP), International Organization for Standardization (ISO), and American Society for testing and materials (ASTM). Most standards specify the required level of weighing accuracy. There are many more ASTM methods which use titration as a method for determination of different parameters, e.g. base number, bromine number. These methods specify sample size as a critical element of the standard. E.g. ASTM D974, D2896, D1159 and more. Accurate sample preparations ensure accurate titration results! Do not hesitate to contact us for an advice. Our expert weighing team is there to help you. Titration is a common laboratory technique which is relatively straightforward to carry out. However, when working with several samples, which may be from the same analyte as well as from different analytes, sample and data handling can be challenging. It's vitally important to label samples and ensure all measurements are correctly logged against the correct sample. Obtaining accurate titration results is highly dependent on preparing titration samples accurately. With several standards specifying precise sample sizes and an associated weighing accuracy, it is critical that the balance used meets the needs of the titration application. For small samples, the minimum net sample weight of the balance must be considered – weighing a sample below this weight cannot be trusted to be of the required level of accuracy. In a busy laboratory, in which many samples are tested every day, a robust balance that stabilizes quickly will ensure operators can keep working on tasks and are not kept waiting for the figures on the display to settle. Manual transcription of sample data, weight values and titration results is also time consuming and prone to error. Keeping titration and weighing equipment thoroughly clean is important to prevent cross contamination. If samples are dirty and/or viscous, weighing and cleaning can become challenging. Excellence level analytical balances are the ideal titration partner for accurate sample preparation. 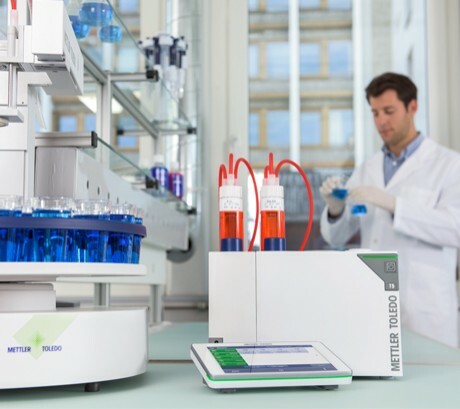 When used in combination with METTLER TOLEDO's SmartSample™ RFID system, sample data and weight values can be automatically transferred from the balance to the titrator. The titration process is greatly simplified and errors associated with manual transcription and data entry are eliminated entirely. Simply attach an RFID SmartTag™ directly onto your titration beaker or the place the tag into the SmartSample sleeve (the sleeve slips easily on and off METTLER TOLEDO 100 mL polypropylene or glass breakers). The titration beaker is placed on a METTLER TOLEDO Excellence analytical balance with the SmartSample weighing device installed. The sample ID, and other sample specific variables such as correction factor and density can be entered into the balance manually or read in using a barcode reader. The sample is weighed out into the titration beaker. The weight value and related sample information are transferred automatically to the RFID tag. 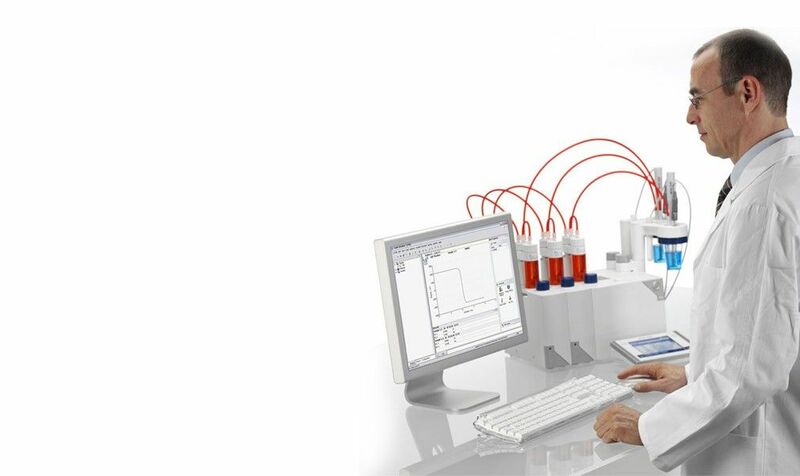 When the beaker is transferred to a METTLER TOLEDO titrator with the SmartSample system, the weight and sample information is automatically transferred to the titrator. Titration can begin immediately, without the need to input any further information. See how METTLER TOLEDO innovative solutions for sample preparation can help you simplify the entire process of titration and enable error-free data transfer. The majority of data that we take down in our day-to-day life is manual, either using a pen and paper or a note-taking application on a smartphone or laptop. But have you ever written down a phone number then dialed it later, only to discover it was wrong? In a lab, this common human error can influence the results of the whole analysis. Connect your METTLER TOLEDO Excellence analytical balance to LabX laboratory software for the highest level of automated data handling and process security. The titration application is started directly from the balance touchscreen and users simply follow the onscreen instructions. LabX automatically takes care of all data and calculations, and all information is saved securely in a centralized database. Excellence Balances connected to LabX have a dedicated entry point for titration tasks that re­quire weighing. Simply select the task and LabX provides step-by-step instructions on the balance to guide you through the sample weighing process. For improved productivity, you can even start your titration whilst weighing more samples. Either start your analysis at the instrument or from the PC and have constant access to both your current sample analysis and the latest results. No matter where you are, the LabX Mail facility can send messages or results to you. Fully automate the selection of the correct method and transcription of samples IDs with a barcode or SmartSample™ RFID tag. Thus, eliminate sample order errors by reading the sample information as you test it, as well as ensuring the right method is selected for each product. The Regulation option of LabX server provides all the necessary tools to help you meet the FDA regulation (21 CFR Part 11) for data ma­nagement and storage. All rele­vant actions taken at the instru­ment or PC are recorded in the audit trail of LabX for full tracea­bility and flexibility, no matter where you work. Gain ultimate efficiency and security for weighing titration samples with SmartSample. Power Your Titration Bench - use the LabX Titration software to optimize your workflow with the titrator.